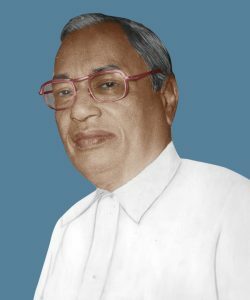 Late Shree Lal Khatuwala was a legendary businessman and a pioneer in the business of Mining and Trading of Mica minerals having firm name Birdhichand Bansidhar. It is his consistency and perseverance over the years that have paid rich dividends. He was a man of confidence and immense caliber having a vision for future and was totally committed to expand his business. He was energetic, intelligent and diligent to business and used to take quick and firm decisions at right moments considering rapid developments in various spheres of trades. He diversified his business in a planned and systematic manner and was amongst the first to start exporting Mica from India. He nurtured his brother to establish offices overseas and take the business to the next level. He was not only a Successful businessman but also a great philanthropist. As part of his philanthropic activities he founded Shree Sankat Mochan Trust Mandir, Shree Koderma Goushala Samiti and Agarwal Samaj in the town. He had also donated land for various other religious and charitable activities. The group was formed in the year 1935 under the brand name Birdhichand Bansidhar, Later in the year 2006 it was separated and formed as Khatuwala group. Over the period we have moved from our traditional business of mining and trading Mica mineral and currently focusing on the trade of Two wheelers, Real estate, E commerce, and Charitable activities. We are committed towards doing business and providing values to its customers. The group comprises mainly of the family members hailing from Marwar, Rajasthan known for their business skills. The Group is based out of Koderma – a small town in the state of Jharkhand and most of our business is being carried out from there. Off late we have setup base in south India with a new project. We envisage the core value as it has been set by our founder and moving forward, we will continue to innovate, evolve, and challenge the dynamic realms of entrepreneurship.